I grew up watching reruns of older shows, including Three's Company. Suzanne Somers didn't play a strong female role in that show, but she is one in real life. Not only is she a well known actress, but she's also a successful businesswoman. You probably remember seeing her in commercials as the spokesperson for the Thighmaster back in the day. She helped have a successful product launch back then, and it's still going strong today. She also has an entire line of natural makeup, skin care, and hair care products that I had the pleasure of trying. Keep reading for my Suzanne Somers Organics review. After Suzanne Somers was diagnosed with cancer, she wanted to eliminate toxins from her life. After seeing how many chemicals are in the products women use every day, she wanted to create a healthier alternative for women. The line includes skin care, makeup, hair care, supplements, fitness products, and cleaning products. Her beauty products are made with organic fruits and vegetables, botanical extracts, anti-oxidants, and enzymes. You'll find products like jojoba oil, aloe, argan oil, shea butter, grapeseed oil, mineral powders, vitamin E, and real fruits. I was really excited to try this product because my daughter loves to paint her nails. She's a nail biter, so she paints her nails so she won't bite them as much to keep them pretty. I love that the Suzanne 10-Toxin Free Nail Polish line is made without 10 of the toxins that are usually found in nail polishes. These quick dry formulas are also cruelty free, vegan, and gluten free. Healthy hair and nails come from having a healthy body inside. The RestoreLIfe Formulas have ingredients that are clinically proven to promote collagen and keratin production for healthier looking hair and skin. I've been having a lot of nail breakage lately, so I'm excited to see how these will work for me in the long term. As always, please consult your personal physician before taking any dietary supplements and before beginning any diet or exercise program. I love when companies package their best sellers together so I can try them. This toxic-free set includes an Ageless Serum, Bioactive Moisturizer, and Liquid Oxygen Facial Serum. If you have fine lines or wrinkles, this is your set. I'm getting fine lines, smile lines, on my cheeks. The Ageless Serum firms the skin and plumps it to smooth out those fine lines. Liquid Oxygen Facial Serum is like getting an oxygen treatment for your skin. It soothes the skin while helping to reverse signs of aging. It helps promote clearer skin while it hydrates for smoother skin. The Bioactive Moisturizer has argan oil and sea buckthorn berry oil to nourish your skin. Use it morning and night as the last step in your skin care routine. It's lightweight and glides across your skin. I have combination, but the wrong products can make it turn oily all over. This gives me enough moisture to keep my skin feeling great, but it doesn't make me oily. Sometimes natural skin care products don't smell that great because they don't add fragrances. This set smells really good. It's a light, fresh scent. which is a pleasant change from other products. My hair feels amazing with this set! The Nourishing Shampoo is sulfate free, so it's safe to use on my color-treated hair. Some sulfate free formulas don't lather much. I know you don't need lather for clean hair, but I have really thick hair, so the lather helps me know that I got every piece of my hair. This shampoo has a light lather thanks to cocoa butter. It also has quinoa to strengthen your hair. I have to be careful with conditioners because I have dry, curly hair that I dye brown and red and have bleached blonde streaks. Some conditioners use silicones to smooth the hair. They coat your hair, so they will make it shiny, and your hair will feel so soft to the touch. But these silicones build up over time, which can weigh down your hair. Eventually, your hair will dry out, break, and look worse because of the buildup. The hydrating conditioner doesn't have silicones, so it conditions without building up on your hair. It uses flax protein and quinoa to strengthen your hair. It has sweet almond oil, argan oil, and broccoli oil to soften your hair and make it shiny. My hair is curly, but I straighten it sometimes. When it's going to rain or I just want a change, I leave it curly. Unfortunately, my curls aren't pretty curls without some coaxing. I use a styling gel because it gives me more hold. The Styling Gel gives me softer curls; it doesn't make my hair stiff. I have had one of these for a few years now, and I love it. I picked up two more: black and mocha. With just one shirt, you can wear it off the shoulder, as a hoodie, or as a cowl. I love mine because they can be paired with jeans, leggings, or a skirt and heels. I can't think of another piece in my closet that is so versatile! I'm a plus-sized girl, and it's very flattering. It hides my mommy tummy and arms. 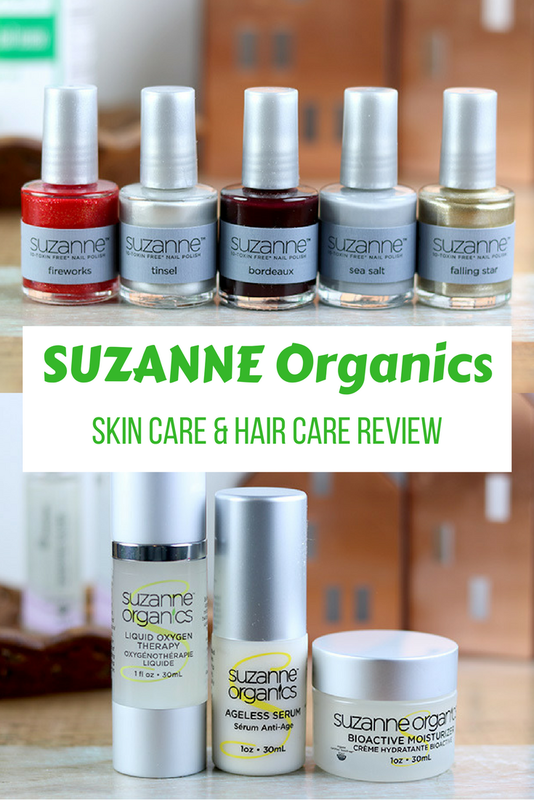 Ready to try SUZANNE Organics for yourself? Use code PRIMP20 to save 20% off your next order!